7.00 points at 9 votes (rank 350). 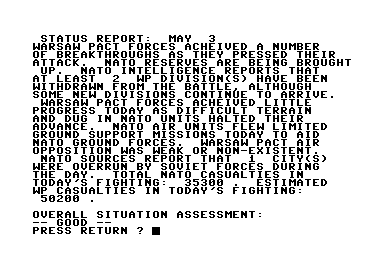 In the demonstration mode, the computer shows an exemplary setup of the NATO confederations. 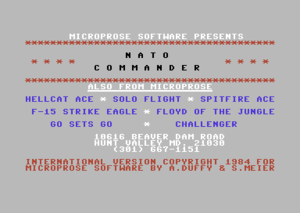 NATO Commander is a war game by MicroProse Software from 1983. 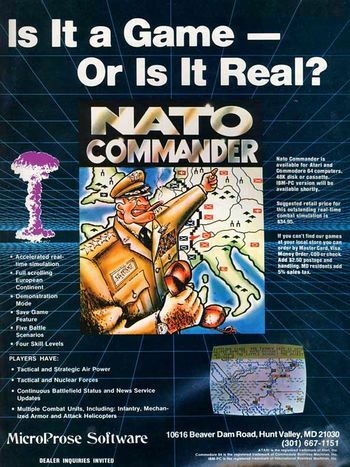 As commander-in-chief of the NATO forces, the player needs to try to fend off an invented attack as part of the Warsaw Pact played by the computer. The enemy's superiority in numbers requires the coordination of the available units of standing army and the air force here as well as using the advantageous terrain and the well-aimed use of chemical and nuclear weapons. The game takes place in real time, whereby five minutes in the game correspond to one second in real time and it can be paused at any time. At the end of each day a status report is shown that summarizes the results of the fights. The situation on the battlefield is evaluated by victory points and triggers in the course of the game a series of events that can be positive or negative for the ongoing war and finally lead to the breakdown of one of the conflicting parties. 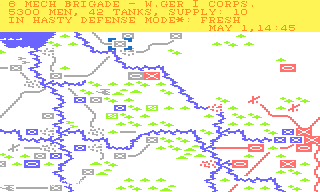 The game owns five scenarios with growing complexity and four difficulty grades plus the demonstration mode of the scenario "Battle for Germany". The "red steamroller" rolls through Southern Germany. In spring 1983 there were massy strikes at the East German border town Wittenberge and numerous crossings of the inner German border by fugitives. The GDR's executive accuses the West German executive of supporting the striking opponents of the regime with weapons and food, which it neither denies nor confirms. After a harsh warning from the UdSSR to the FRG not to get involved into the inner affairs of a member of the Warsaw Pact and the threat to surpress the revolt at gunpoint if needed, the NATO troops are alarmed. When East German dissidents then announce that they have contacted the Federal Republic to discuss the reunion of the two German states, the NPA blocks all the accommodation roads to Berlin. At the same time, American and British outposts near the borders report a deployment of Soviet tank units. Although an outbreak of hostilites is not officially confirmed by the Soviet executive, it proclaims that "appropriate options" were taken to react to the provocations of the West. 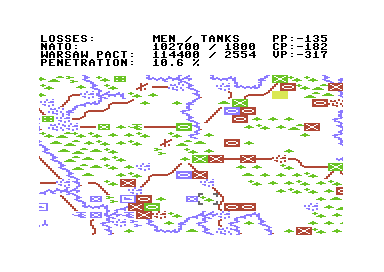 The graphics are, as typical for a war game, kept rather somber and consist of a mixture of military symbols and simple icons for units and terrain characteristics as woods, towns or rivers on white background. It is striking that the map appears to be quite compressed and the borders and names of towns are not displayed, which does aggravate the orientation. 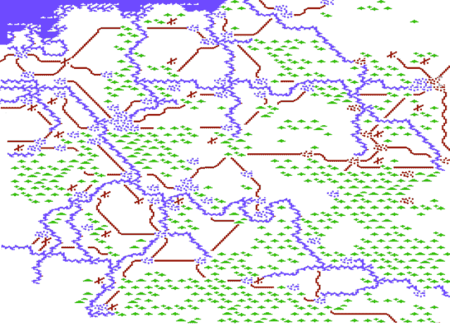 Depending on the chosen scenario, the map can comprise several screens and can be scrolled by moving the cursor to the border of the screen. The game area itself is divided into invisible hexagons, so that the units can be moved into six directions. Each game area can only keep one unit, and units cannot march through occupied fields. The game has day and night phases: After 22h it gets night and the map is black-shaded until sunrise at 7h. Fitting the sparse graphics, the sound consists only of two totally different effects: a signal peep for incoming messages and a "buff" sound when attacks take place. The status from 3rd May shows that the situation seems to be under control. The player tries to cause enough losses to the Warsaw Pact, to keep important cities and at the same time minimize his own losses. If he makes it, more and more states belonging to the Pact will leave the war and finally the Kreml will agree to peace. The position of the Pact Units is only shown in whole at the start of the game. Then the units slowly disappear from the map, if the player does not conduct recon missions with his air force (see below). The enemy's fighting strength is not displayed. 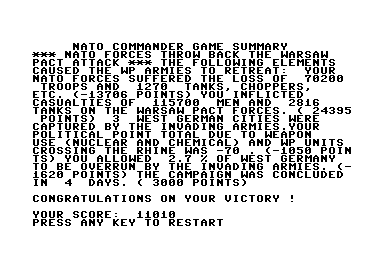 The victory points system in NATO Commander is divided into political points (PP) and combat points (CP). The sum of both makes the victory points (VP). Depending on the victory points, there is the possibility that special events are triggered (see below). With the help of G an overview of all points can be viewed at any time. Each town that is conquered by the enemy will cost political points, same as each use of chemical or nuclear weapons. Each unit of the Warsaw Pact that crosses the Rhine costs political points. Each reconquered town gets you political points. The combat points are calculated from the own and the hostile losses. You should aim for a relation of 1:1,5 or better. Furthermore, the combat points are influenced by the terrain that the Warsaw Pact wins ("Penetration"). Therefore it is important that you allow as few units as possible to cross the Weser in the north or to advance west of Munich in the south of the map. Each unit can have one of four possible combat modes: tactical mode, hasty defense mode, defense mode or prepared defense mode. Movements and attacks are only possible in the "tactical mode", however, in this mode the unit is most vulnerable against attacks by the enemy. If a unit stays at one place for a longer time, it automatically starts to dig itself in, until it is finally in the "prepared defense mode" and has received the maximum attendance for defense. It will likewise take correspondingly longer until a unit can change from the "prepared defense mode" back to the "tactical mode" to move or start attacks. Each unit has - depending on the strain by the effects of fighting - one of five possible states: fresh, pressured, tired, broken or routed. The worse the state of the moral, the longer it takes until a unit can conduct your commands. Units in withdrawal ("broken") or on the run ("routed") additionally suffer losses by attacks, in the worst case the unit surrenders to the enemy ("must surrender"). Units recover slowly, if you let them rest for a longer time. The situation worsens when Helsinki surrenders. As soon as a certain number of victory points - influenced by a scenario and the difficulty level - is reached or undercut, events can happen which signal that one of the two conflict parties gets closer to victory or failure. These events are always shown linearly, i.e. an event must have happened before the better or worse scenario can happen. (++++): Yugoslavia retreats from the war due to failures of the Pact states. (+++++): The Kreml agrees to peace negotiations: victory for the NATO! (----): Western Germany pleads for a truce: victory for the Warsaw Pact! Each scenario can be played in one of the four difficulty grades and can additionally be aggravated by the increased use of brigades instead of divisions on the NATO side. The Warsaw Pact attacks without any advance notice. Therefore there is no loss of political points in this scenario, contrary to the normal rules, but there are losses by using chemical weapons and Pact Units that cross the Rhine, contrary to the information on the screen. Only the northern part of the map is used. Nuclear weapons cannot be used. As scenario #1, but the loss of cities costs political points. Only the northern part of the map is used. Nuclear weapons cannot be used. Through a surprise attack by the NATO air force, the NATO has the absolute air supremacy for the whole scenario and can by this concentrate from the start fully on the ground support and recon missions. The price for this is a severe loss of political points and the loss of some towns cost twice in this scenario. About half of the map is used. Nuclear weapons are available. The Italians are undecisive whether they want to support the NATO in combat. Therefore all loss of political points (use of chemical and nuclear weapons, loss of towns, Pact Units that cross the Rhine) is doubled. A better part of the map is used. The ultimate scenario. There are no special rules. The whole map is used. Nuclear weapons are available. US and British units are shown in blue, German armed forces and units of the Benelux states are shown in green. The main part of the NATO troops consists of mechanised infantry the size of divisions or brigades. Infantry units are not as forceful as formations of tanks of the same size, but they are well suited to defend strategically advantageous positions as towns, rivers and mountains. The infantry is especially prone to chemical weapons. Infantry brigades are significantly weaker than divisions and are almost exclusively suited against an already weakened enemy or for attacks on paratroopers that land in the rearward area. Tank troops also appear in divisions or smaller brigades. Although their military clout is significantly higher than the one of the infantry, they should not be used in rashly attacks without support of helicopters or other ground units. The air forces of the NATO operate from their airports in the west of the map and can do three different missions: 1. "Air Superiority", to eliminate the hostile air force and thus raise the effectiveness of the other two missions. 2. "Ground Support", to improve the chances of success for the ground troops in attack and defense. 3. "Reconaissance", to find Pact Units, that are not in direct contact with the NATO troops and else would be invisible for the player. Airports are immobile and need to be protected from attacks by ground troops. These likewise stationary units serve to fight the hostile air force. The longer they stay in the game, the more damage they can cause. They are defenceless against attacks from ground troops and need to be protected the same as airfields. Helicopter units are especially forceful and can - in contrast to ground troops - attack from any distance. In combination with tank troops they are well suited to destroy isolated Pact Units, but equal to the airfields and SAM batteries they are immobile and therefore quickly overrun if the enemy manages to reach them. These units are the "ultima ratio", the last mean that can only be used when the enemy has already conducted nuclear attacks or the total situation is so desperate that there are no chances of success with the use of conventional weapons. Shooting nuclear weapons needs to get authorized first and it needs some preparation time before a requested strike can be done. A hit by nuclear weapons costs the bigger part of a unit's strength and leaves a crater on the map. Of course does such an attack provoke equivalent answers from the opposite side and the use also causes a bitter loss of prestige, which is shown through a deduction of "political points". These units are also stationary and defenceless in close combat. Froom the 3rd May onwards these units consisting of reservists start to form. Their combat force is neglectable and they can at the very most be used to defend towns and even then only as an absolute fill-in. Paratroopers are only used on the side of the Warsaw Pact and are mainly used to seize airports or launching sites of nuclear weapons. Do not underestimed their combat force, although they have little possiblities to cope with a unit the size of a division. To guard the corresponding facilites it is usually enough to have some infantry brigades. Roads allow the fastest movement possible. Big rivers as the Elbe, Weser or Rhine and waterways such as the Dortmund-Ems Canal or the Midland Canal significantly slow down the movement of all units that move over them. At the same time they provide a good defense position and give units that are on them a bonus against attacks. Woods and mountains slow down all units and give a bonus for defense -same as rivers. Mountains are more effective than woods. Together with mountains are towns the terrain which is best to defend. A unit in the "prepared defense mode" can hold even against an overwhelmingly hostile superiority for a relatively long time in a town. The loss of towns costs political points in most of the scenarios. After the first day the computer will name a code letter and the player is asked to enter the corresponding answer code. If this is not done, the game gets unplayable: units cannot be chosen any more and the screen slowly fills with graphical garbage. After the correct code has been entered, it is enough to press Return after each day. F1 ABORT GAME: then Enter to confirm Q SITUATION IN AIR: shows the force of the own SAM and the ones of the Pact Air Force. W WHO? : shows the source of the last radio message T TERRAIN: blanks all unit symbols to make the terrain below visible. Accelerated: causes more damage on both sides. S SAVE GAME: save the game. F FREEZE: pause the game. points (PP), the combat points (CP) and the victory points (VP). H HERE: marks the field below the cursor as a target for a movement or attack order. L LOAD GAME: load score. X CANCEL: deletes all orders given to the chosen unit previously. The cassette version of the game consists only of a shortened version of the shown events and needs to be reloaded after each party. NATO troops defend doggedly the line Hamburg-Hannover against the penetration efforts of the Warsaw Pact. If the scenario "Pre-emptive Strike" is not played, then the hostile air force must be eliminated first. For this you need to give the order to the bigger part of the own air force for "Air Superiority". As soon as the resistance of the enemy has sunk to "light" after a few days (check with Q ), you can go over to fly "Ground support" missions. The Berlin-Garnison is quasi condemned to fail. It is futile to rescue it and the best you can do is to endure as long as possible to delay the arrival of besiegers on the West German terrain. With a bit of luck, however, you can rescue brigades that were already pushed out of Berlin into the northeastern or southeastern direction and let them rest there. If it is in the offing that a unit in defence mode gets surrounded by hostile divisions and gets grinded down, there is no point in giving them the order to retreat. The change from defence mode to the tactical mode takes too long and additionally reduces the defence power, so that the unit gets destroyed with almost certainty before it can escape. Here it is almost always better to let the units offer resistance until the bitter end. Attacks against hostile ground troops should always be done by several divisions simultaneously, preferrably by tank troops and ideally in combination with attacks by helicopters and/or chemical weapons. Infantry is best used in defence of towns and suited terrain (towns, mountains). You should give them enough time to reach the status "in prepared defense mode". Infantry should never attack out of a movement. After the gross of the Pact troops has crossed the border, small, mobile units as e.g. the Dutch Armored Cavalry Brigade or maybe some remainders of the Berlin Garnison, can cautiously try to free overrun towns again to reach political points. But before that some air force units should do some recon flights to avoid unpleasant surprises. Nuclear weapons should only be used against hostile divisions, that are in a fight with NATO troops, never on such that are still in movement. By the delay of up to a few hours that are needed to conduct a nuclear attack, the chance is too high that the enemy has already moved away from the target field. Before you enter each command, the game should be paused with F to not let time pass unused. Generally it is indispensable to stop the game every few seconds, alone to keep the overview over everything. 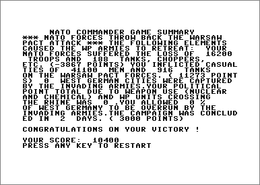 Robotron2084: "Playing NATO Commander was a real rollercoaster ride for me. At first I was a bit helpless and confused, what to think of a war game in real time, then I was enthused by the conduction of it and some fast victories in the low difficulty grade, then again so frustrated by the deficiencies and the peculiarities of the programme that I wanted to give up on it as unplayable rubbish and finally I was quite content. I do not know to what extent the real time element is important for the game at all, as you have to press the "Freeze" key all the time anyway to be able to enter the next orders without losing time. 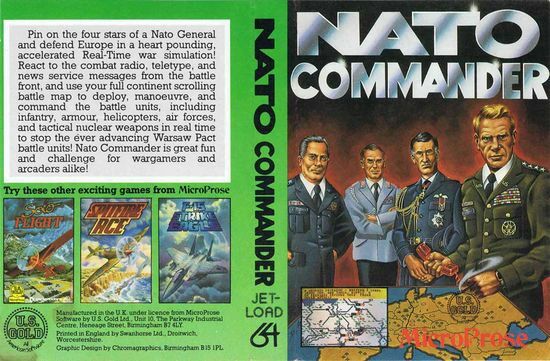 Therefore, NATO Commander could also have been released as a round-based game without further ado, but of course this would not have been anything special in 1983. I am personally bothered in this game by the fact that you are not informed about the enemy's strength and then units sometimes move totally and uncalculably slow (NATO) or respectively fast (Pact). Sometimes a tank division needs a mortal half day to move forward one tiny field in the game, which then leads in critical situations to frustration, but it might be realistic, because what is in a war that can be calculated? What I have to give the game credit for is that the AI conducts in almost every party a different attack method, which can lead to nasty surprises. With this it stands out from comparable games as Theatre Europe or Kampfgruppe, but without being able to reach their atmosphere or clearness (Theatre Europe) or respectively their richness of detail (Kampfgruppe). Also the element of luck seems to me to be a bit too big, which in my opinion counts unfortunately for the complete "Command" series by MicroProse. In short: for the decided war gamer who is ready to occupy himself some time with the game offers NATO Commander smooth and exciting entertainment with mediocre complexity and I finally give for this after long hesitiation 8 out of 10 points." 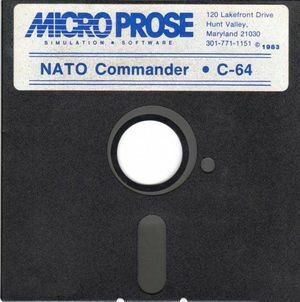 NATO Commander was the forerunner of the "Command" series by MicroProse. This series comprises the titles Crusade in Europe, Decision in the Desert and Conflict in Vietnam, that are based on an improved engine from NATO Commander. The programmes have made a horrible goof-up when determining the date: the programme does not account for the fact that after the 31st May the 1st of June should come up, so it is possible, freely adapted from Erich Kästner, to go on playing until the 35th of May...ouch! Quote by programmer Sid Meier from a gamespot interview: "...the lessons from NATO Commander are probably more negative ones than positive. I thought it was a cool game, but it wasn't a direction where there was a lot more for me to do there." . Another comment by Meier, unequally more negative, from the book High score! : the illustrated history of electronic games: "It was not even fun to play. It was just bad." Cover of the US-Gold cassette version of the game. Advertisement for the US version of the game.